With the holidays right around the corner, I thought it would be fun to pull together some inspiring Christmas doodle ideas. Bujoling Christmas doodles include hot chocolate, candle, candy cane, gift, snowflake, Christmas tree, and holiday greenery. Anncakes.art created an entire page of various Christmas trees that you can doodle. Her other page on this spread is loaded with holly, Christmas ornaments, gifts, stockings, bows, and lots of stars! 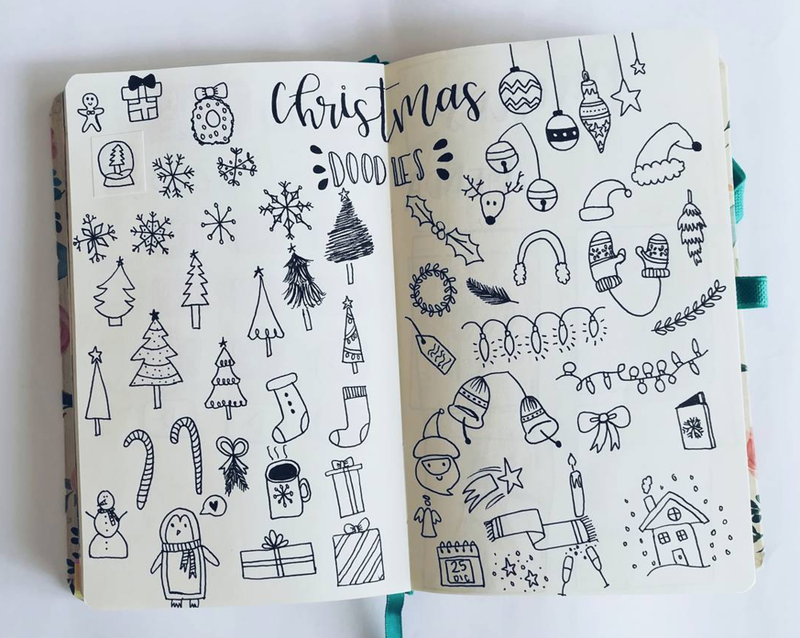 the doodle planner created a lovely page all about Christmas decorations! She just made sweet little doodles all about how she decorated her home. Check out the star on a tree, fairy lights, wreath on the door, nativity, candles, holly sprigs, tinsel, and baubles. 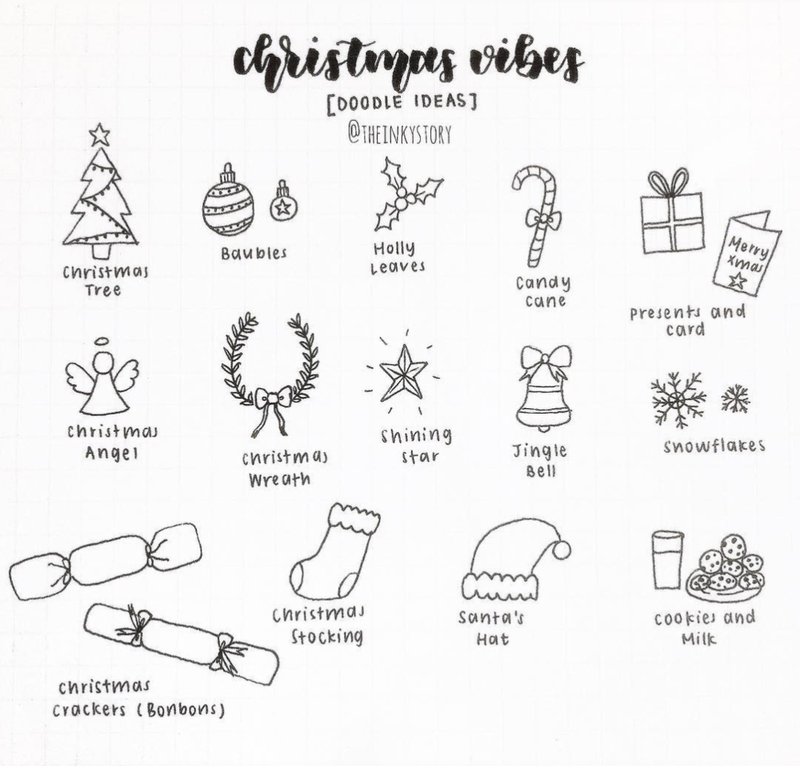 One of my favorite Instagrammers, The.petite.planner created a step-by-step Christmas doodle page. These doodles include Christmas tree, Christmas lights, a present pile, reindeer, Santa, and a wreath. Tirkey_surya created a circle with Merry Christmas in the center and then surrounded the word with tiny doodles. Fr.asp created an entire month of holiday doodles by participating in a doodle challenge. Each month has a Christmas (or New Year’s) inspired prompt. I think this would also be a great day to count down to Christmas almost like an advent calendar. Create prompts for yourself for each day leading up to the big day. Lona_aalders also created a ball with a word in the center and then surrounded it with doodles. What I found really creative was that she turned it into an ornament! Rather than saying Merry Christmas in the center, she wrote December and now it works as a monthly intro page in a bullet journal. 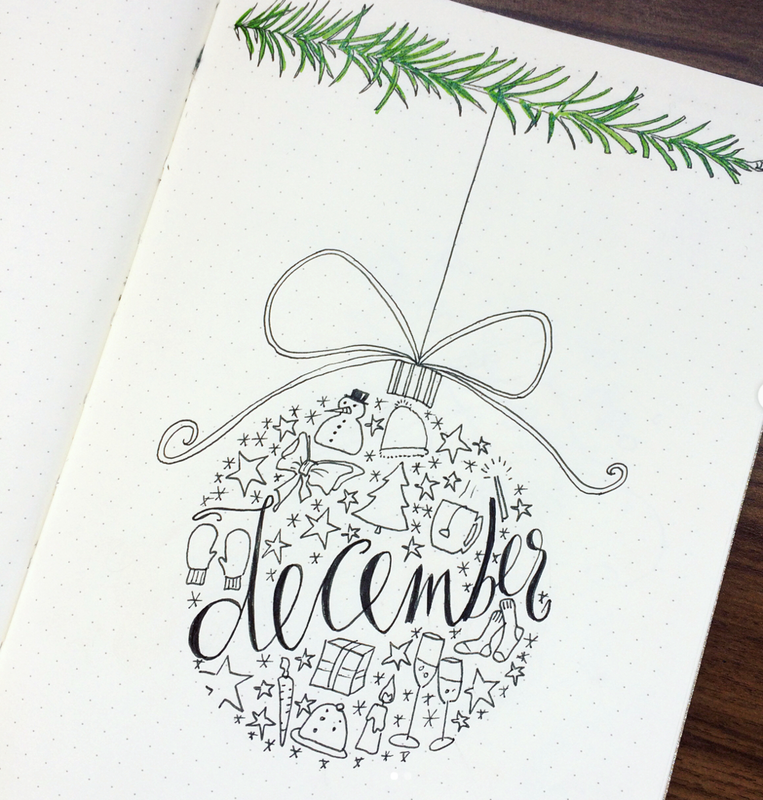 This bullet journal spread is packed with Christmas doodles! There are lots of great ideas for winter wear, ornaments, Christmas trees, snowflakes, stockings, candy canes, packages, Santa and so much more. Christmas doodle ideas created by Theinkystory are clean, cute, and easy to duplicate. I love the Christmas crackers, cookies & milk, and Christmas angel. I hope you liked these Christmas doodles! If you are just getting started with bullet journaling, start here for a Beginners Bullet Journal Guide. If you want to check out my favorite planning and bullet journal tools, you can check them out in my Resource Guide. How to Use a Bullet Journal Key?